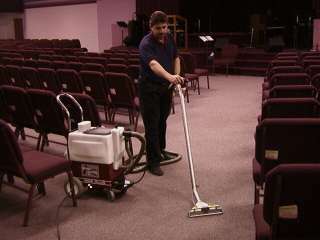 Cliff uses extraction system on carpeting. The CFR Environmental Cleaning System used by Exact Extraction Carpet and Upholstery is a water based extraction method. As the cleaning solution is applied it is also being extracted in the same flow of motion. Relatively new, this system allows for quicker drying time as it does not saturate the backing, padding, or sub-floor of your area. The cleaning solution is environmental friendly, and leaves a clean, fresh scent. Protectant is also available and is recommended as it allows your carpet to stay cleaner longer by resisting stains, and protects the longevity of your carpet. CFR's patented high energy application and recovery system is based on three unique principles. High energy solution application atomizes high velocity solution to power wash each individual fiber providing the fastest drying time in the industry. Instantaneous solution recovery integrates solution application and retrieval into a single, uninterrupted process. Since the solution is always in motion, it's almostimpossible to over wet fabrics. Continuous flow recycling virtually eliminates dumping and refilling in the middle of a job because the patented CFR filtration system cleans the recovered solution and recycles it up to seven times without loss of cleaning effectiveness.